The Voynich Manuscript eludes solution, as the text cannot be translated. The text seems old and tests as genuine but inscrutable. Here is an example from one page https://www.jasondavies.com/voynich/#f88v_f89r1_f89r2/0.327/0.474/3.50. There is a heavy coverage of plants; perhaps it is medicinal in its orientation. It is written on vellum and has been dated to the early 15th century and possibly created in Northern Italy, per its entry in Wikipedia. While in Norway, Christianity was replacing the old pagan religion, churches previously pagan were rededicated as Christian. Likely this is true of Gol, whose timbers have been dated to the 12th Century. In the latter 1800s, this church was moved from Gol, Buskerud county to near Oslo. Though I do not know how old the visible wall paintings are but there was a tradition of painting Biblical stories on walls for the predominantly non-reading congregations to study. Tapestries may also have been used. 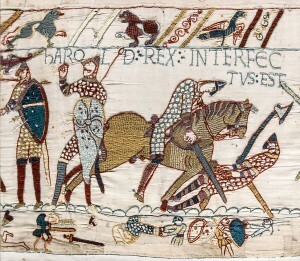 Most famous of tapestries, the Bayeux commemorates the Norman Conquest and the Battle of Hastings (1066). Technically, it is not a tapestry as it is not woven but embroidered. Part of its purpose was to educate and remind those viewing it of history. It does include some text often to identify people (Here King Harold has been killed).